Alice and I got up early yesterday morning and headed north to Copper Harbor to work at the Estivant Pines. As usual, we tried to make our trip to town serve multiple purposes. Houghton is 20 miles away, and we have never developed the attitude that we can just jump in the car and run to town regularly. With that attitude, things pile up and tend to get taken care of in a slug. We drove the car and truck to Hancock, and dropped the car off at the tire place. We were getting some road noise that I didn’t like the sound of, so decided to let the tire experts have a look at it. We were to call them mid morning from Copper Harbor after they’d had a couple of hours to look at it, so we could decide how to proceed. We talked about the poor cell service in Copper Harbor, and the tire guy said he was sure there were pay phones in Copper Harbor. We drove north to Mohawk, and stopped at Slim’s for breakfast (a family tradition.) 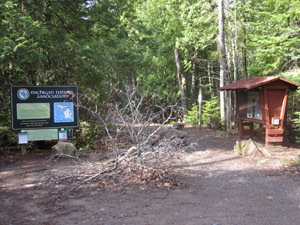 After a full belly, we continued north and got to Copper Harbor a bit after 9:00. There were indeed 3 pay phones in Copper Harbor. The first one I tried had a quarter jammed in it such that no other quarters would go in. I poked around in there with my Leatherman for a few minutes and gave up. The second one at the General Store had a big sign on it saying OUT OF ORDER. The owners said the only working pay phone was at the place across the road, so we drove over there. After putting two quarters in and dialing the number, someone did answer on the other end, but they could not hear me. Shoot. We gave up on calling them and continued out to the pines. We were greeted in the parking lot with a maple tree that blew down. It is not unusual for us to encounter lots of blow-downs on our first trip to the Pines in the spring. They tend to accumulate over the winter, and we always come equipped with the tools to remove them. This one was scary, though. If it had fallen slightly to one side or the other, it would have taken out our expensive parking lot sign, or our lovely information kiosk. Lady luck was swimming by our side this time. 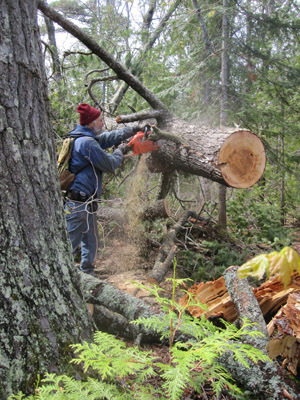 We hiked all the trails and had to chainsaw about 23 trees over the trails. Some were small and some were huge. There were several more trees that were small enough for us to just carry off the trail without starting the saw. I am conscious of the noise that machine makes, and try not to start it unless it is necessary. What a machine a chainsaw is! Some of the monsters I had to move would have taken me all day to deal with if all I had was an ax. We managed to get the trails in tip-top shape in about 3 hours of pretty heavy work. 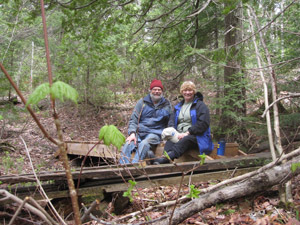 About 3/4 into the project, we stopped at a small bridge that Alice and I, along with Estivant Pines Friends Pete and Stella built last summer. I managed to prop the camera up on a stump, set the timer, and crash through the creek in time to get this shot. We got all the tree sawing done and back to the parking lot. I told Alice I had discovered two loose treads on the long boardwalk we had built several years ago. I told her I’d like to walk back up there and fix them. I was worried someone would step on them wrong and hurt themselves. Trooper that she is, she accompanied me back to the boardwalk. Last thing we did as we left the parking lot was to stick a spare battery into my tool belt. It took a while to find the offending treads, and when I did, I started screwing the first one down with my cordless drill. One screw got partway down when the battery died. I smugly removed it and put on the replacement one I had brought at the last minute, and continued to work. I got all three treads pinned down nicely, and we headed back to the truck, and then headed home. The first time we had a bar on our cell phone, I pulled over to the side of the road and called the tire place. They told us we needed 3 new tires. These tires were new a year and a half ago, but if they were shot then so be it. We told them to go ahead and put them on, and they had just finished up when we pulled in the driveway. Alice took the car home, while I took the truck over to another place to have the driver’s side mirror replaced. It seems some bonehead was throwing the dog’s stick in the garage, hit and broke the mirror. It wouldn’t be so bad if it would have been the first time this had happened, but it was in fact the second time. Our future plan is to switch from stick throwing to tennis ball throwing when we’re in the garage. This entry was posted on Wednesday, May 25th, 2011 at 9:56 pm and is filed under Uncategorized. You can follow any responses to this entry through the RSS 2.0 feed. You can leave a response, or trackback from your own site.